For 2015, I’d like to adjust my lifestyle a bit. There is a smallish reason: I’m having a baby in a few months. So that said, whether or not I want to change my lifestyle (even a little bit), this train already is underway, and I’m on board for new adventures. This got me thinking about lifestyle blogs. Here are a bunch that recently crossed my desk. Messy Nessy Chic covers offbeat, unique, and chic. The founder and “boss lady of this ship” is Messy Nessy, also known as Vanessa. Vanessa is a former Londoner who moved to Paris. The co-founder of Messy Nessy Chic is Alex. “No one had known that hidden behind the door of his single-room apartment at 851 Webster Ave in Chicago, the penniless and reclusive janitor had been living a secret life, creating densely typed volumes of fantasy manuscript, possibly the longest novel ever written at more than 15,000 pages, accompanied by several hundred striking drawings and paintings, many over 10 feet long,” the blog says. Honestly, the pictures were amazing. What an incredible post. Other Messy Nessy Chic pieces that caught my eye include The Hotel of Childhood Memories: An Old Italian Schoolhouse turned Charming B&B, 13 Things I Found on the Internet Today (Vol. CVII), and Taking a Lonely Stroll through Britain’s Conflict Ghost Town. I happen to *super love the first item on Vanessa’s 13 Things list. I’ve been to The Morgan Library and Museum; it’s indescribably awesome. Especially the library. The next four blogs all came in as recommendations through PR Newswire for Bloggers. Thank you to everyone who submitted these fabulous blogs for review. 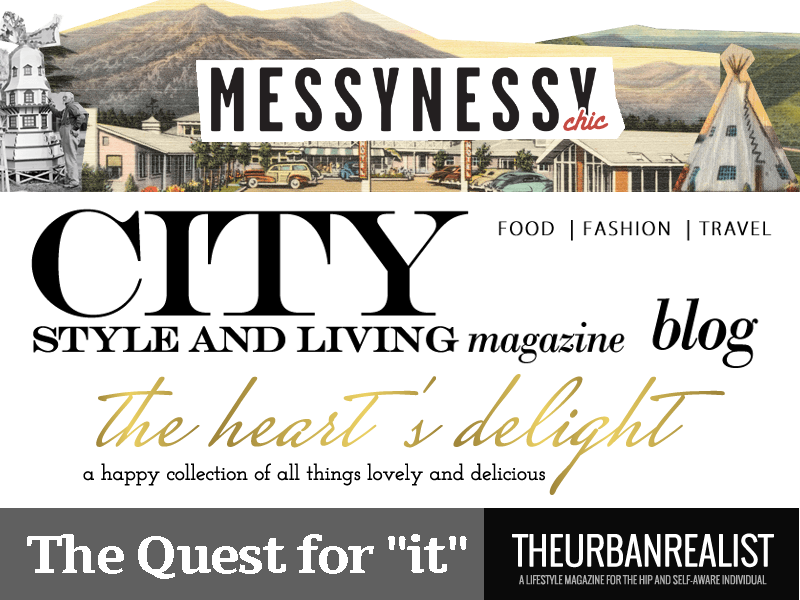 TheUrbanRealist is a lifestyle mag for millennials. It was nominated by founder and editor Danasia Fantastic. “Inspired and driven by the stark reality of the quarter-life crisis, our features cover everything from fashion and the best places to party, to personal growth and being thrifty,” the blog says. This is a fun blog, and I’m really glad Fantastic brought it to my attention. TheUrbanRealist covers a number of topics, including fitness, dating, travel, fashion, and entertainment. Some posts that I enjoyed include 5 New Year’s Resolutions You Need to be Making in Your 20s (although, honestly, these are great tips for your 30s, too. Just sayin’), 4 Tips for Delivering Bad News, and Due West: 5 Lessons Learned From the Road. In the last post, I especially connected with this tip from blogger Nora Artinian: “Make a plan, but then go rogue.” Sometimes you just have to go with the flow. The Heart’s Delight is a “happy collection of all things lovely and delicious by blogger Stella Compiseno. Compiseno is a former Wall Street exec and busy mom of two young children. “I was in desperate need of a creative outlet where I could express my personal style — in fashion, food and home,” she writes. “Finding a passion to call my own was an exciting proposition and a nice distraction from the day-to-day grind. Having full creative freedom is something that I do not take for granted, and I hope you enjoy this final product. I happened to love Compiseno’s 5 Must Have Items for 2015. Especially the gingham/plaid. Totally agree. I love gingham. The call on marsala being a big spring color is unexpected and interesting. I’d like to see where this goes. Other posts I liked include Life Lessons Learned in 2014 and Rocky River Holiday Home Tour (the photos … absolutely gorgeous). The Quest for “It” covers art, fashion, and media. It was created in 2005 by blogger Tia Walker. Walker writes that The Quest for “It” was one of the first fashion blogs ever to cover the New York Fashion Week tents of Bryant Park as press. “What began as an undying effort to reach the ‘it’ life has become an enjoyable and informative resource for every person on a quest,” Walker says. I loved several posts on this blog. I’ll start with New Year’s Eve Outfit Ideas and move on to Dallas Cowboy Justin Durant Hosts Holiday Toy Drive Benefitting Boys and Girls Clubs of Greater Dallas. Also, this one was a pretty good read: Puma Names Rihanna as its New Creative Director. City Style and Living Magazine Blog is a Calgary, Canada-based lifestyle magazine that covers the globe’s food, fashion, and travel news. The blog was nominated to PR Newswire for Bloggers by editor Kailash Maharaj. This is an incredibly attractive and engaging site. For example, I’d visited Omaha, Neb. once (very briefly) and this post on 35 Reasons You Should Visit Nebraska (Omaha, Lincoln and Sarpy County) Now made me really want to go back. Like, soon. Other notable posts include Just Back From … South Carolina, USA (I visited Charleston, SC last August. It was spectacular, in my opinion) and Pastry Chef Showcase 2014: A Photostory. P.S. Ever wonder how we come up with ideas for our blog profiles? Our handy list of industries and subjects on PR Newswire for Journalists stays top of mind. If you’re a blogger or journalist looking for ­­­­­­­lifestyle (or specifically fashion, food, travel, and media news), let us know. We’re happy to customize your feeds on PR Newswire for Journalists.